Need a transparent object for your cosplay? 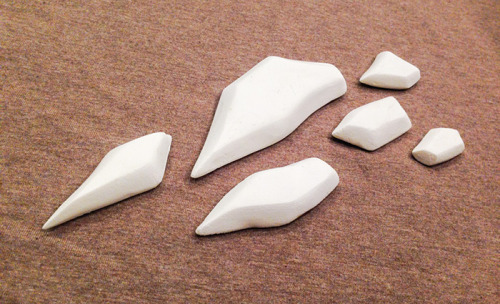 Worbla’s TranspArt has you covered, but what about a three dimensional object like a gem? Better yet: how about one that will flex with your fabric? Forcing flat sheets of TranspArt to do your bidding can be a little tricky, and working with clear resin is tough for even experienced cosplayers. 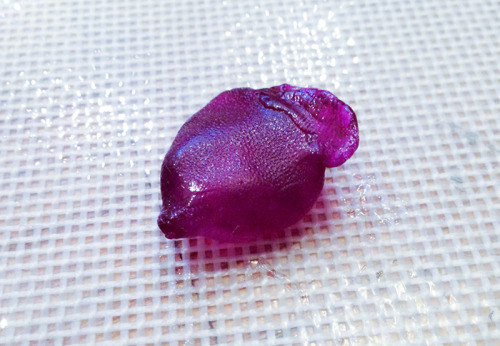 Instead, we had the chance to experiment with a new product called Crystal Pellets, which is a super easy alternative for making small semi-transparent items that flex even after hardening! Crystal Art come in small, clear beads that meld together after you apply heat, which means they are great for pressing into silicone molds or just molding by hand. 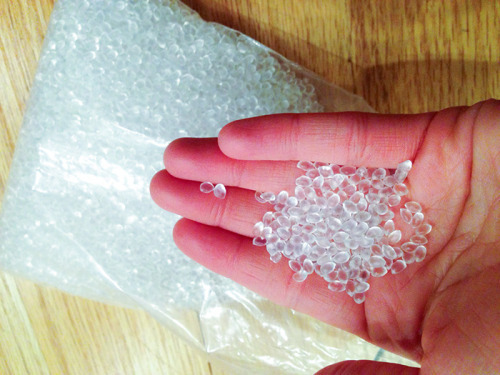 If you’ve worked with opaque friendly plastic in the past, this is a very similar product – these beads can be heated with a heat gun, in a toaster oven, or even in a pot of near-boiling water (always be sure to heat them in a pot you do not use for food). If using a toaster oven or a heat gun try to place your pellets on silicone of some sort to keep them from sticking to plastic surfaces. These pellets can be re-heated again and again after cooling so like most of Worbla’s line they are completely re-usable with no waste product – if you make a mistake, just apply more heat and try again! Instead I liked using these silicone finger tips, which provided just enough protection so that I could moosh the pellets around. They’re also much easier to clean residue from. You can pick either these tips from most craft stores in the Mod Podge accessories section, or heat-proof gloves from cosplaysupplies.com. 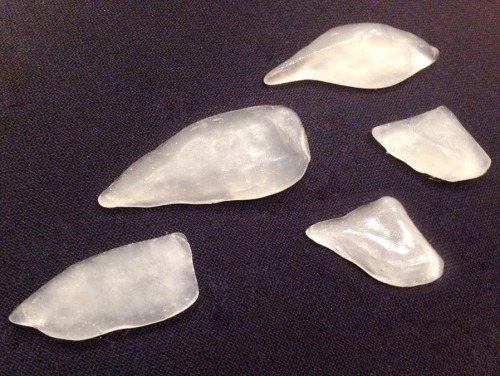 For my first Crystal Art project, I decided to mold several clear “ice crystals” for Yuri’s Eros costume from Yuri on Ice. This seemed like a perfect choice for crystal pellets since the crystals need to be transparent but flexibility is a huge plus, since they would be attached directly to fabric. For Yuri’s ice we created our own silicone mold, but if you have a pre-made mold, skip straight to part two! 1) To get started, sculpt clay versions of your ice crystals from any sort of hardening clay, ideally something like paperclay or wet clay that can be sanded. Allow to dry for several days until they are completely hard. 2) Once hardened, sand away any imperfections in the clay to try to achieve a smooth, flat surface. 3) Create a container with tall walls for your silicone mold. We used aluminum here, but Legos or even Tupperware works great too! 4) Place your clay pieces in the base of your mold, leaving a bit of space between each object. Spritz the bottom and sides with mold release. 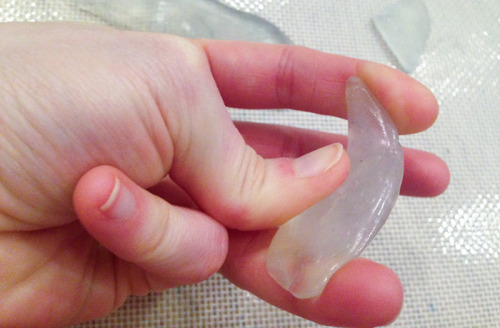 5) Put on your non-latex gloves and mix your silicone in a cup per the manufacturer’s instructions. We like to use Smooth On’s Rebound-30, which is a two part mixture that sets up quickly. 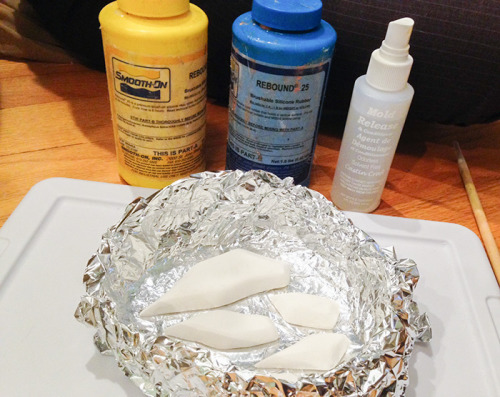 Pour your silicone into your container, completely coating your clay pieces, and allow to set. 6) Remove your hardened silicone mold, remove the clay pieces, and clean any residual clay dust from the mold using rubbing alcohol. Now time for the fun and easy part! 1) Pour a small amount of crystal pellets onto your baking mat. An easy way to estimate how many you need is to first pour the pellets into your mold and then add a small amount of extra pellets to make up for the space you will lose when the beads are squished together. 2) Heat the pellets using your desired heat tool. If using a toaster oven, put the temperature on the lowest possible temperature. My oven only began at 275 degrees, which was unfortunately a little hot, so if this is also the case for your oven be sure to keep a careful eye on the pellets and take them out very quickly! If heating in a pot, like the toaster oven you do not need much time at all in this heat. Pop your pellets in hot but not boiling water, and remove when the plastic turns glassy. 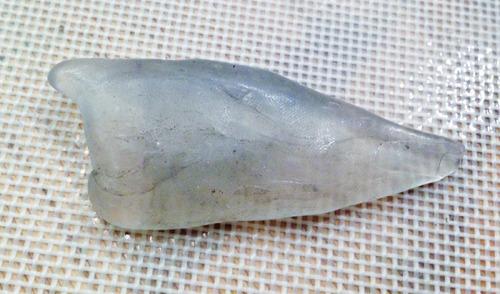 3) You can then kneed this mass together to form a solid, slightly more opaque shape. 4) If your plastic begins to stiffen slightly, heat it again until it forms a slightly glassy ‘sheen’ like in the below photo. 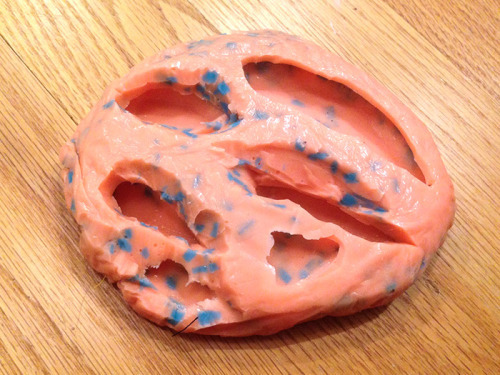 The plastic should now be malleable enough to easily press into your mold. 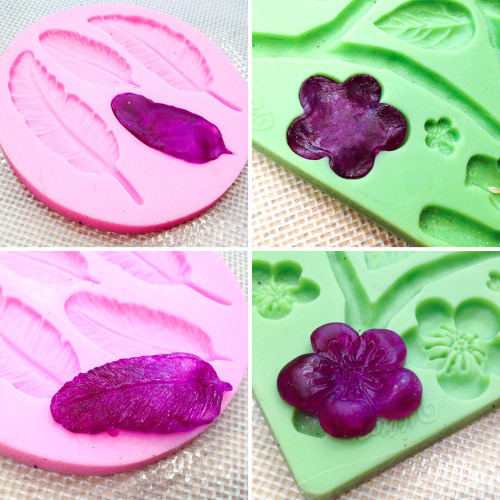 5) Place the plastic into one of your molds and press down hard with your fingertip. Continue pressing until it has filled every space in the mold. Allow to set for several minutes. 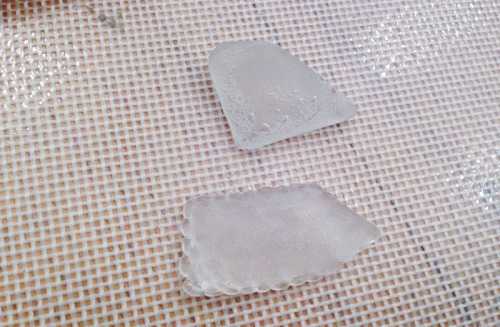 6) One hard, remove your new ice piece from the mold. Repeat this process for your remaining ice pieces. One of the cool things about Crystal Pellets is how flexible they are even after molding! This is perfect for Eros because the piece will flex with the fabric. Bear in mind however that the thicker your piece, the less flexible it will become. It’s also important to bear in mind that your final piece will not be perfectly transparent. TranspArt will also take on this slightly cloudy appearance once you heat it to a moldable state. 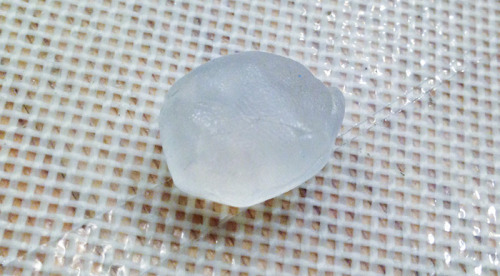 Folding and heating the plastic immediately caused the pellets to cloud up slightly – this is not very noticeable with flat pieces but the thicker your plastic piece, the less transparent it will look. We tried a few experiments to see if it was possible to smooth the pellets into a solid form while still maintaining transparency, but unfortunately you really do need to work the plastic at least a little bit in order to mush it into a solid shape. 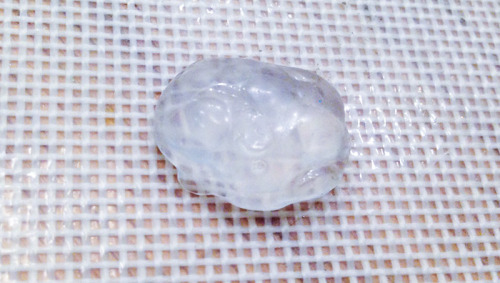 Heating the plastic directly in a silicone mold will smooth out the front but not the back or center, and even heating in a toaster oven at 300 degrees will not be enough to completely remove the trapped air. Above: Pellets heated in a silicone mold in a toaster oven. The pellets picked up more residue than usual, creating a cloudy look. You can also still see trapped air bubbles in the center of the plastic. This is really not a great way to heat your plastic. The best method we found for the clearest result was to heat the pellets once and then form your shape without re-kneeding or re-heating. This gives less opportunity for dust or residue to accidentally find its way into the plastic. 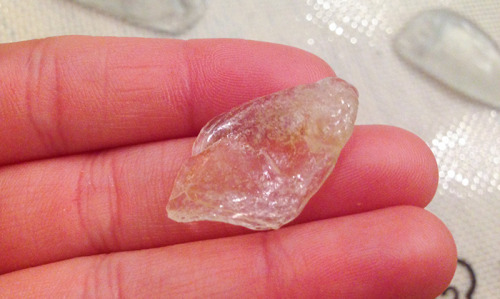 Just like transpArt, Crystal Art can be easily dyed using any sort of color that ‘sticks’ to plastic! In the Cow Clan house this means sharpies or iDye Poly, but you may find other options that work too. 1) To dye your Crystal Art with iDye Poly, heat a small amount of dye in a pot that you will not use for cooking in the future. Heat your water to hot but not boiling. We do not want to completely melt the plastic or it’ll be a little tough to clean out of the pot. If you do not have a non-cooking pot, you may instead heat your water and then pour it into a different container, such as a plastic bucket. 2) Drop your plastic into the bucket/pot. Personally, I like to mush the pellets together before dropping it in – it is a lot easier to fish out a single object instead of many pellets, plus you will get a much more accurate sense of the color. 3) Remove your plastic once it’s reached the desired tint. For a light tone you will only need a few minutes in the dye, or for deep tones you may leave it in for up to thirty minutes. Darker colors like purples also seem to absorb faster. 4) Run your plastic under cold water to remove any residual dye. Both clear and colored Crystal Art work great for use with LEDs! 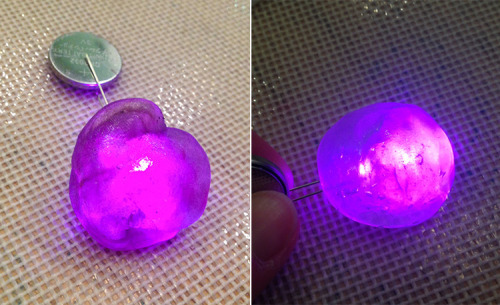 Just like resin gems, light from an LED will bleed throughout the entire piece. Just place your LED either behind the plastic or even embed the light within the Crystal Art before it hardens! All in all I’m a fan of this material – while there are a handful of clear materials out there, this is by far one of the most user-friendly and beginner-friendly to use! Thanks again to Cowbutt Crunchies Cosplay for sharing this writeup and tutorial with us!